Cromarty first appears in historical records in the 1200s, as a royal burgh protected by a castle. Only royal burghs were permitted to trade and Cromarty appears to have flourished in its early years. There were later periods of prosperity – in the early 1700s, when exports of salt fish grew; and from the late 1700s, when improved agriculture brought greater income to landowners, local farmers and merchants. In the 1790s there was a view that it could overtake Inverness as the principal commercial centre of the north. The town’s hemp factory, fish processing, pork curing, ship-building, brewing and sea-borne trade were a model of what could be achieved in a small Scottish town. Cromarty grew to reach a peak population of just over 2200 in 1831, when a disastrous decline set in — but it remained the biggest settlement in the Black Isle until a century later, when it was overtaken by Fortrose. 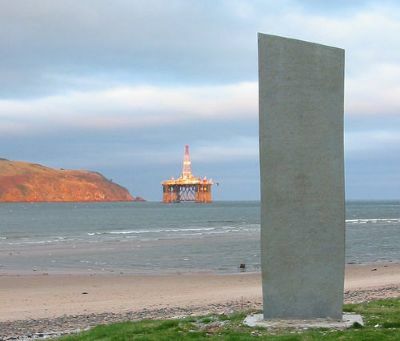 Cromarty’s later history could be described as a lesson in the art of survival. The town had to live with decline and find new sources of employment. In the end, this is a success story — but there is a sting in the tail. Cromarty folklore, recorded by Hugh Miller in the 1820s, included tales of an older town lost to the sea. This is likely to be myth – but a myth which may become reality. It now seems likely that, at best, sea levels will rise by one metre [3¼ft] by the end of this century (see www.climatesafety.org). The town of Cromarty has a history of over 750 years. Urgent action is needed if it is to have a similar future.